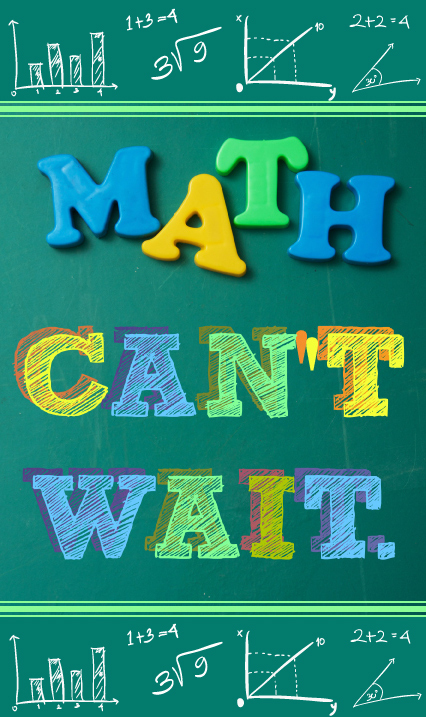 You’re probably doing so much already to weave math concepts into your classroom. Every storybook, every activity, every snacktime gives you more chances to make math come alive and show students with and without special needs how math connects with the real world. But you’ve only got so many hours in the day, right? To really get kids ready for long-term math success, you need parents and guardians on board too, supporting and supplementing the great work you already do. 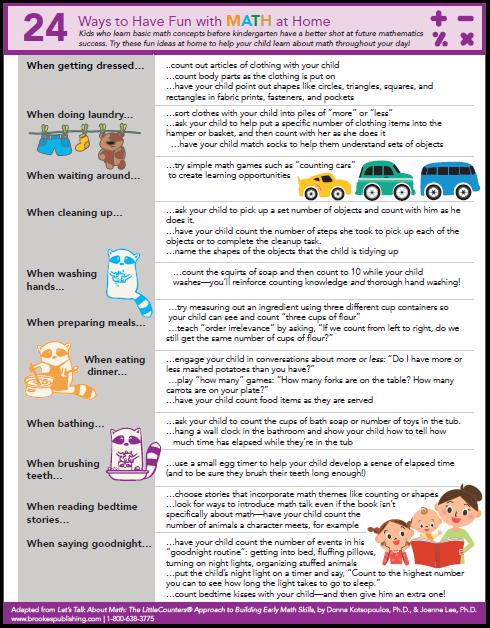 And the good news is, even the most math-phobic parent can start doing that right now–for free!–with just a few small changes to their home routines. Mealtime. Many kids look forward to mealtime and love to help out in the kitchen. 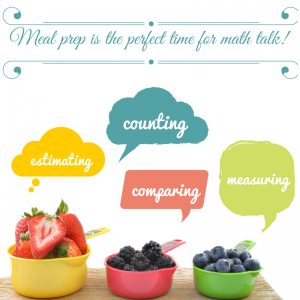 Meals are the perfect time to get children counting, measuring, estimating, comparing, and recognizing shapes. Parents can have kids measure and count cups of ingredients, count how many plates and utensils are needed for the whole family, and figure out who has more or less mashed potatoes. Personal care & hygiene. 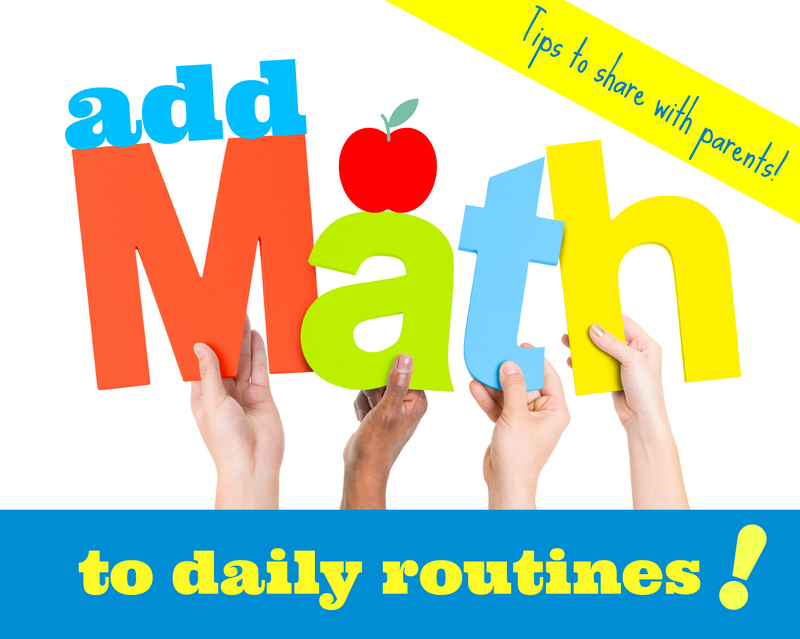 Parents can easily turn dressing and grooming into an opportunity for math talk. During toothbrushing, a small egg timer can help a child develop a sense of elapsed time (and help them brush their teeth long enough!). When a child is getting dressed, parents can count out articles of clothing with their child and point out shapes like circles, triangles, squares, and rectangles in fabric prints, fasteners, and pockets. And during hand washing, parents can help the child count the squirts of soap and then count to 10 while they wash.
Chores. Getting kids involved in household tasks in early childhood is not only a good way to teach responsibility–it’s a great way to teach math skills! During cleanup time, parents can have the child name the shapes of the objects and count the number of steps she took to complete the cleanup task. Kids can learn math during laundry time by sorting clothes into piles of “more” or “less” and matching socks (a good way to help them understand sets of objects). And math can bloom in a garden–kids can measure water into a watering can, tally days on a calendar to keep track of plant growth, and count seeds, plants, flowers, fruits, and vegetables. These ideas are all from Let’s Talk About Math by Donna Kotsopoulos and Joanne Lee. There are tons of other great tips in this book, so we’ve made you a printable handout you can share with parents when your new year starts. 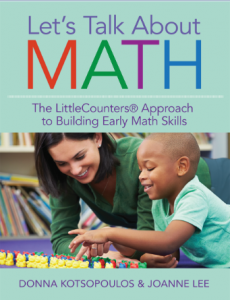 It’s one more tool you can use to strengthen the home”“school connection and make sure kids start kindergarten with the math basics they need to succeed. 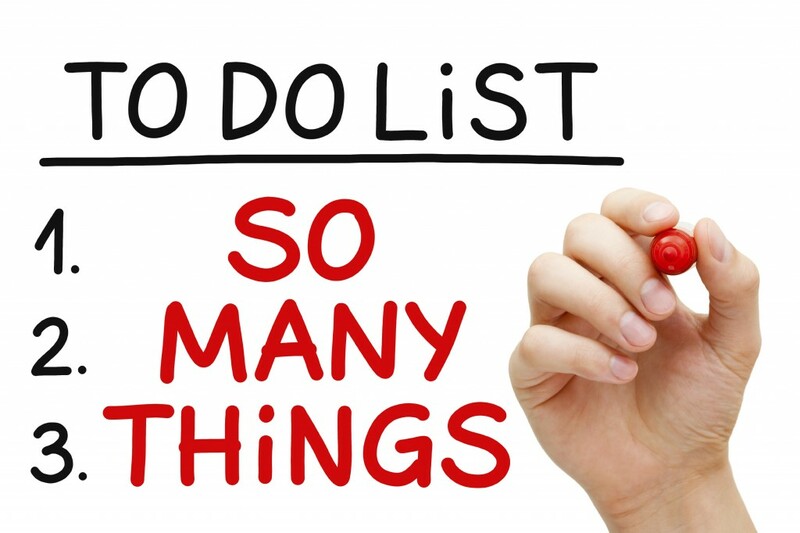 YOUR TURN: Teachers–what’s your best suggestion for weaving math into everyday activities? 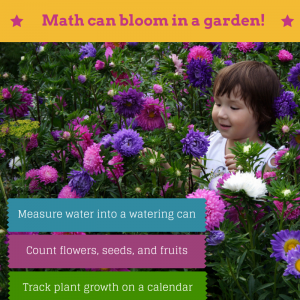 And parents–how do you sneak crafty little math lessons into your home routines? Share your knowledge below! Pick up Let’s Talk About Math and learn more about using purposeful play with kids to promote mathematical thinking and get them ready for formal math instruction.